Dubai: Kochi Blue Spikers, Calicut Heroes or Chennai Spartans: do the names ring a bell for you? 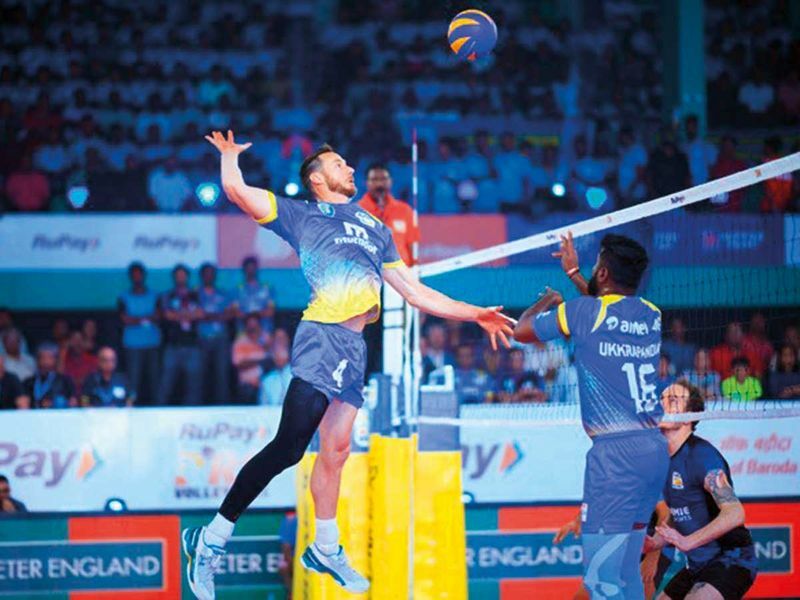 May not be as yet but they are three of the six franchises who are kicking up a storm in the southern part of India in the Pro Volleyball League (PVL) — the next big thing in the burgeoning world of franchise sports leagues in the country. It’s been exactly a week since the professional men’s volleyball league announced its much anticipated arrival in Kochi, the thriving commercial capital of Kerala, where the ‘home’ team secured a thumping win over U Mumba Volley. The Rajiv Gandhi Indoor Stadium in Kochi are currently hosting the league stages of PVL with the first 12 matches before the action moves to Chennai (Jawaharlal Nehru Stadium) — which will host the last six ties, including the final, on February 22. The two other teams in fray apart from those mentioned above are Ahmedabad Defenders and Black Hawks Hyderabad — with each of the teams culled from a players’ draft last November and represents the cream of Indian players and international icons. The six international icon spikers include David Lee, an US Olympic gold medallist turning out for the Kochi outfit. Speaking to Gulf News from India, Joy Bhattacharjya, the CEO of PVL feels that the early signs had been extremely encouraging. “There was a lot of excitement among the fans and the players even before the league began. The players had been waiting for a league like this for a long time and couldn’t wait to showcase their skills in front of packed stadiums in matches broadcasted live on Sony,” said Bhattacharjya, a former team director of Kolkata Knight Riders, the Shah Rukh Khan-owned IPL franchise who had seen the cash-rich cricket league blossom up close for first six seasons. If the IPL had been understandably the pioneer in ushering in the franchise sports leagues in India over the last decade, several other disciplines had done well in playing the catch-up in football (Indian Super League), hockey (Hockey India League), badminton (Pro Badminton League) and kabaddi (Pro Kabaddi League). The latest product in the assembly line, a brainchild of the Volleyball Federation of India (VFI) and sports marketing company Baseline Ventures, looks a promising venture but questions about the saleability of the sport — which has a niche appeal — remains. Striking an optimistic note, Bhattacharjya says: “Volleyball, as a sport, has all the ingredients of becoming a blockbuster on television. It’s a team sport where the action never stops and in fact was one of the most watched sports at the Rio Olympics. If all goes the way it is going, the teams can easily break even in three years’ time. Asked the selection of the franchise cities reflects a bias towards the southern part of India, he said: “Volleyball is popular throughout India. Having said that, we couldn’t ignore the fact that the sport is almost a way of life in the south and it would have been unfair to not have teams from the cities from where we eventually ended up having teams. That, however, doesn’t rule out the possibility of teams from other parts of the country in the future editions,” he observed. Finally, how does one see RuPay PVL benefiting the sport of volleyball in India in the long run? “RuPay PVL hopes to rekindle love for the sport in the country. A lot of people love the sport but don’t have any club to support as the football or cricket lovers have and the league is for those.